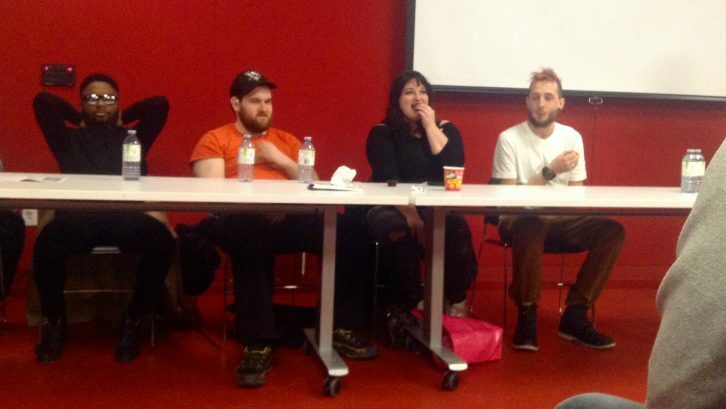 RADAR Mental Health hosted a film screening and panel discussion at the Halifax Central Library on Thursday night to spread awareness about mental health. The films are written and directed by local youth with mental health issues and showcase the struggles they go through day to day. RADAR Mental Health hopes that the films educate people on what life with mental illness is really like, and ultimately to eliminate the stereotypes that surround mental illness. One of the films, titled What Do You Think of Me Now?, directed by Carrie-Ann Boutilier, deals with the fact that people who struggle with their mental health often feel the need to put on an act in front of people. Another film, Psychotropic Side Effects 101, looks at how the side effects of medication can sometimes be worse than the mental illness itself. After the films, there was a panel discussion with the films directors’ about the successes and challenges they found with their projects. RADAR Mental Health stands for Recovery Advocacy Documentary Action Research. It is funded by the Canadian Institutes of Health Research. It hopes to teach youth with mental health issues how to make short films to tell their story. The project started in September 2014 and is active in Toronto, Montreal and Halifax. Since it began, 15 videos have been created in all three cities. “The fact that people got together and made the videos is a success in itself, because … some people said ‘oh, people with mental illness are not going to be able to make these videos, they’re too severe, they’re not going to be able to work the camera equipment’,” Whitley said. In Halifax, RADAR Mental Health is partnered with Laing House, an organization for youth with mental illness. Steph Young, a community support worker at Laing House and video mentor for the Halifax site, joined the project in November 2014. Young said she believes the project has been successful because of the positive response audience members have had to the films. At the screening, viewers were given comment cards, which show that the films positively changed many people’s opinions on mental health. Young hopes that people will be interested in these films because they were made by people dealing with mental illness, opposed to being just another documentary. “It’s an act of resilience, refusing to be tokenized, and refusing to be put under a microscope. Getting your own narrative and getting your voice out there really brings out a sense of agency,” she said. This screening is the first of what Whitley and Young hope to be many. Whitley would like to have more screenings for university and high school students, among others. “The best way to break stigma is to target certain subgroups. We want to show each video to health-care providers, because some evidence shows that health-care providers actually have a lot of stigma,” he said. Young said she believes that the program has positively affected both the audience members and the filmmakers.